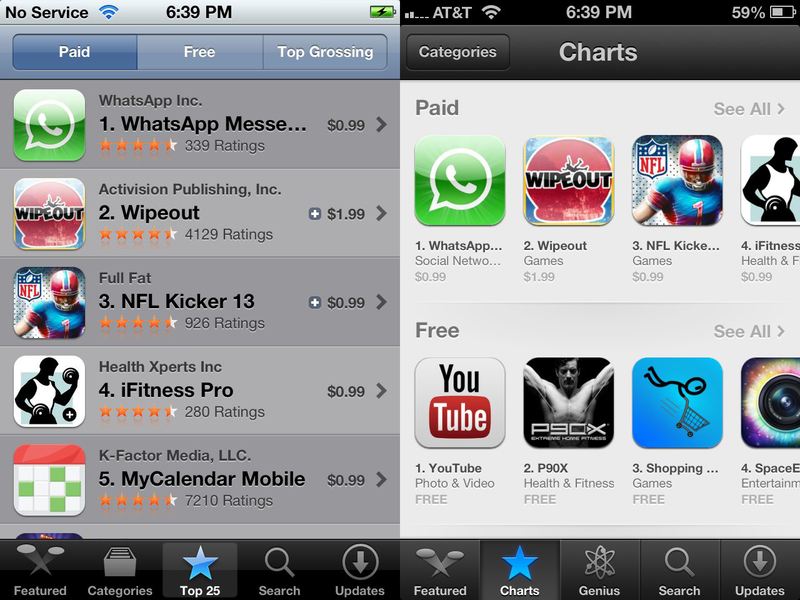 On Wednesday when iOS 6 came out, I spent some time analyzing the various changes to the mobile app store. Below is a freeform list of my observations. Jeff Scott at 148apps.com published his story, titled App Store Changes in iOS 6 Lead to Developer Concern yesterday utilizing some of my research along with his own insightful observations. 1. They have relegated the prominent “Categories” Tab at the bottom of the mobile app store to a position on the upper left and replaced it with a new “Genius” Tab (Moved from the top of iOS 5 app store). 2. They have completely REMOVED the “NEW” button that used to be at the top next to Genius button. This is likely because they are simply way too many “new” iOS apps everyday that this is no longer helpful like it was. 4. If you tap “Top 25” on iOS 5 you are presented with the top 25 paid apps and you have to go out of your way to tap the less noticeable “Free” and “Top Grossing” tabs. If you tap “Charts” on iOS 6, you are presented with three rows (two fairly equal weighted and the other below the fold). This gives MUCH MORE prominence to the Top Free Apps and so I predict Free apps and Freemium apps will see a big boost after today. 5. The new charts on iOS 6 show the icons larger. 6. In the new charts, the price MUCH SMALLER relegated to tiny gray text under the category name. 7. The app name in charts/categories is also now truncated at 9 characters instead of 14 so that “WhatsApp Messe…” on iOS 5 becomes “WhatsApp…” on iOS 6. 8. The VERY prominent Star Rating and Ratings Count in iOS 5 has been removed from the charts list in iOS 6 which will hurt 5-star apps, help lower-rated apps and favor ICON design and app name over customer ratings. 10. In iOS 5 app store app, the description was EVERYTHING because it was at the top of the detail view. Developers spent tons of time on the first few sentences. In iOS 6, the screenshots are moved to the top giving those much more prominence and relagating the description to a sidenote since users are likely to be attracted to the new prominent “reviews” tab before they ever get down to reading the description. Apple also used to show the entire description on a long-scrolling page and now it is limited to 5 lines and a “More” down arrow button. 11. In iOS 5, reviews were listed in order by most recent. In iOS 6 they are listed in order by “most helpful” which is odd because users can only vote “most helpful” on iTunes desktop and those are typically the most negative reviews. 12. Before, when you tapped to see reviews in iOS 5, you just saw the average, now you are shown a big chart that breaks it down like in iTunes. 13. Next to “Details” and “Reviews” is a new “Related” button which should favor developers with lots of apps. 14. This is a major change. Category Lists used to have a Paid tab, Free Tab and Release Date Tab which defaulted on first view to Paid. Now the Release Date section has been replaced with Top Grossing and all three lists are presented in rows on the main first page view. 15. When I first launched the App Store on iOS 6, I was presented with a page showing all of Apple’s Free apps and reminding me to download all of those. Find My iPhone is NOW the #1 Free Utility because of this change. 16. Before, when you use “Search” on iOS 5, you would see a long list of results (first 5 above the fold) and the star ratings and number of ratings was very prominent. Now, in IOS 6, you see exactly ONE result with a larger icon and a screenshot. You have to swipe left to see more results.